'The Movement Park' in Hillsboro encourages people of all ages to have fun and be active. When Hillsboro-resident Molly Courtney opened up her own gym last month, she was sure she could design a gym that catered to everyone, from toddlers to senior citizens. 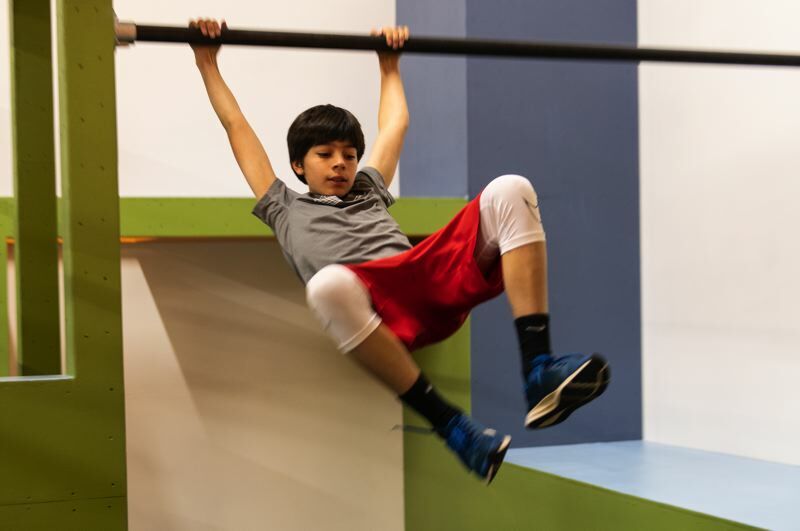 That gym, The Movement Park, is Hillsboro's only gym specializing in parkour, a training discipline that originated from military obstacle course training. Parkour is about getting from point A to point B as efficiently as possible, Courtney said, but popular movies and online videos showing people scaling buildings and flipping across expanses isn't what most people experience. "I would say what you see on Instagram and YouTube is the extreme," Courtney said with a laugh. "It's like the slam dunk of parkour. You don't have to be able to do a slam dunk to enjoy basketball and (it's the) same with parkour. Many people are like, 'I don't know what that is,' and I remind them, that at one point in their life they played on a playground and it's basically that — being able to see something and go, 'How can I maneuver that, or get around that, or up and over it?'" The Movement Park, 2240 N.E. Griffin Oaks St., resembles a gymnastics gym, with spring floors and obstacles to climb over and under. But this type of gym is different, Courtney said. "We are offering an environment where all ages can be in the same class," she said. "Because it's so adaptable, and because you can change it and make it very unique to each individual, and they can make their own choices within the class, we can have all ages in the same class." Courtney has worked in gyms for years, and worked as a health and wellness coach. She said she was drawn to parkour after watching her son participate in a class at Revolution Park, a parkour gym in Beaverton. "I was like, 'I just want to do it too," she said. "We found that there weren't very many places for adults to move in that way or form, so we wanted somewhere that adults could do that. I worked in fitness for a long time and I was the personal trainer who never liked to workout at a gym, so my preferred form of movement was more playful." 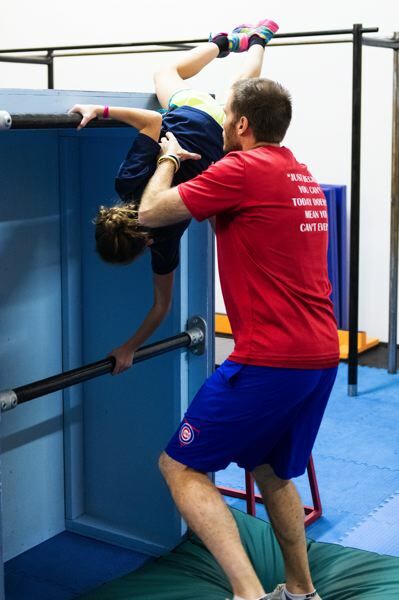 She and her husband began taking classes with their son and inquired about opening a parkour gym in Hillsboro. The gym is now a "sister" club of Revolution Park — which has locations in Gresham and Tualatin as well. "I think all of them have their own unique mission, so for us, it's very family-oriented," she said. "A big part of our mission is getting families to move together. I think there is a huge potential for modeling there — kids watching their parents move and being able to witness that, and move in a way that's not beating my body up, or chasing calories or chasing performance, but just kind of an enjoyment of movement. I think there is a huge potential there." Through her journey in health and wellness coaching, Courtney said she frequently heard from clients how intimidating exercising in a traditional gym setting can be. Others would quickly get bored using the same machines or weights over and over again. "Both my husband and I felt that way too, just for ourselves and our own workouts," she said. "We wanted something a little bit more fun, (where) people could enjoy themselves. A lot of times, when you go to a fitness class, everybody is doing the same thing at the same pace and you feel a lot of pressure to keep up, and you feel a lot of pressure to perform. There is a lot of competitiveness." That's not how her gym works, she said. "One of the things that really attracted me to parkour was that it's neutralized. It's not a competitive sport and in every course they are doing, there are multiple paths to take, so if you don't feel like doing something that day or you don't feel like it's appropriate for your body, you don't have to," Courtney said. The Movement Park is currently open six days a week, Monday through Saturday, offering various classes — including a cycling class — throughout the day and evenings for people of all ages, with plans to extend hours and class options in the near future to appeal to all demographics. "Nowhere else do adults really have permission to be silly and play, and especially in a movement or a physical expression," Courtney said. "If you can mindfully and intentionally include more play in your life, it can have huge mental health benefits as well as physical benefits. ... I think for me, parkour became an avenue to deliver the mission that I really want to make movement more accessible — more fun for the majority of people. So many times we are trying to fit the person into the mold of exercise instead of the reverse of it, so that's my mission in my heart." Where: 2240 N.E. Griffin Oaks St.